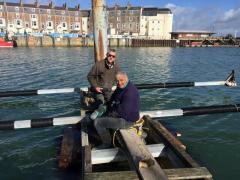 To add to the list of major maintenance activities being carried out at the Club this winter, the Squibbers have been working hard at replacing the decking on the Squib pontoons. 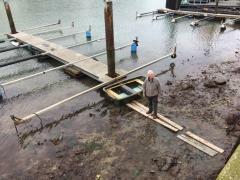 The original, decaying, wooden bearers and planks have now been replaced on two of the pontoons by (hopefully) maintenance-free, recycled plastic bearers and resin decking panels. 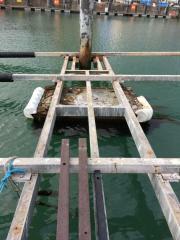 The decking panels originally formed part of the RNLI Lifeboat access pier. 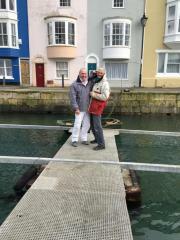 The Institution has recently installed a new pier and Steve Pitman has done an outstanding job in arranging for the Club to obtain the surplus replaced decking panels, free! After many days of labour and a constant re-learning of the old lesson ‘measure twice, cut once’, the restored pontoons are now ready for use. Thanks are due to the many who contributed their time and labour to a difficult and fiddly task but in particular to Vernon Taylor, Peter Jackson, Ray Capp and Simon Vines, who put in multiple shifts and performed sterling work. Special thanks, too, are due to the fleet’s project engineer Rodger Horlor, ‘Nuts & Bolts’ Jackson for his procurement efforts and to Vernon for his expertise and for generously providing loans from his most comprehensively equipped toolshed – it would all have been quite a struggle without Vernon’s support.